If you have limited time or a small budget for promotions, you may want to focus your efforts on your most active contacts. The Pareto principle states that, in many situations, 80% of the effects come from 20% of the causes. This is often called the 80-20 rule. In business, this means that 80% of your sales are likely to come from only 20% of your contacts. With a few clicks in Infusionsoft you can quickly build a list of the contacts that click links in your emails the most often. By focusing on this 20%, you can maximize the value of your marketing efforts. Step 1: How many contacts have clicked at least once? To start, you’ll need to know how many contacts have clicked at least one link in an email. Go to Marketing→Reports, then choose Click Through Percentage Search By Contact. With the default settings, click Search. The number of contacts will appear in the upper left of the search results. For example, “1-50 of 2,124” means you have 2,124 contacts that have clicked at least one link. Step 2: Which contacts click the most links? Next, adjust the filters to narrow the list to the most active clickers. The goal is to target the most active 20% of contacts that have clicked at least one link. In this example, we had 2,124 contacts that clicked at least one link, so we want to narrow the list to about 425 contacts. This will take some trial and error until you find the filter that works best for you. 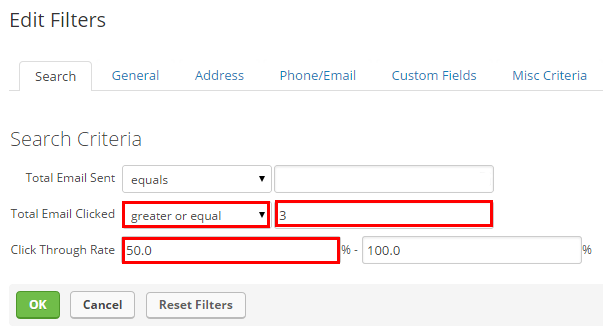 Adjust the Total Email Clicked field to find the contacts that have clicked the most links, not taking into account how many emails they have been sent. Set this field to greater or equal and choose a low number, around 3 to 10. This will filter out contacts that have only received a few emails. Adjust the Click Through Rate to find the contacts that click links that are sent to them more often than others. Set this to 50% – 100%. Adjust the 50% up or down until you narrow your list to 20% of your total contacts. Adjust both of those fields to find contacts that have clicked several links and a high percentage of links. You’ll probably want to go with option #3 and adjust both the total email clicked and click through rate fields. Continue to adjust the two fields until you’ve narrowed your list down to about 20% of your contacts. Step 3: Save the search! Now that you have a list of highly active contacts, click the Save button to save your search. This will allow you to market directly to these individuals in an email broadcast. You could also tag them or manually put them into a campaign of your choice using the Actions button. You can also use this tip to find the top 20% of specific segments of your list. When editing the filters, go to the Misc Criteria tab to include or exclude tags, lead sources, or owners. You can use the Custom Fields tab to include or exclude contacts with specific field values.